Until builders allow our Architects to specify resilient building methods and products we will only see the cost to defend homes continue to increase. We have the ability to build homes today that can stand up to fire, if our builders would allow their architects to specify resilient products instead of pinching every penny for granite counter tops. Rapid population growth and the desire to live near forests means new housing in western Montana is being built in wildfire-prone areas, increasing taxpayer-funded fire suppression liabilities and putting lives and property in danger, according to a new study. Half of all new homes built in Missoula County, between 1990 and 2016, were in areas at high or moderate risk from wildfires. In Ravalli County, more than 90 percent of homes built in the same period were at “high wildfire hazard,” says a report from Headwaters Economics in Bozeman. Ravalli County’s 6,987 houses built in high hazard areas during that 26-year period are more than in all other western Montana counties combined. In Missoula County, 2,234 houses were built in the most fire-prone areas and another 2,153 were built in moderately dangerous areas. "What happens", he said, "is that people living in the fire prone areas individually benefit from a nice place to live while not taking on the full cost of the wildfire risk. You’ve privatized the benefits and socialized the costs." Headwaters, an independent research firm, used data from the Montana Department of Revenue and Missoula-based wildfire threat assessment research firm Pyrologix. Pyrologix was hired by the U.S. Forest Service Northern Region to compile the data. 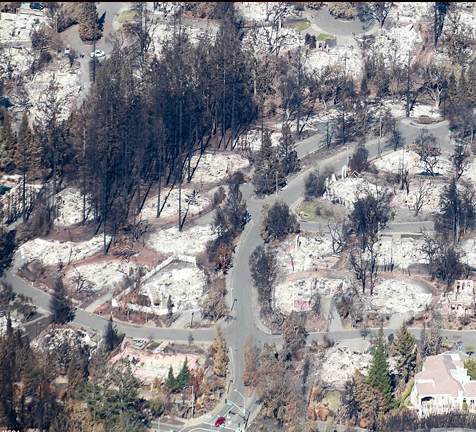 To determine which areas are high wildfire hazard areas, the company used wildfire simulation modeling that incorporates the likelihood of a wildfire burning, the intensity of a fire if it were to occur and the “generic susceptibility” of a structure to those intensities. The 25 counties in western Montana studied were categorized by the Forest Service into three classes based on relative hazard: High, moderate and low. Headwaters found that if development near fire-prone forests continues and global temperatures continue to rise, fire suppression costs in Montana will increase by at least $4 million every year. The report said that is a conservative estimate, because recent studies in Oregon and Northern California show that there are higher firefighting costs associated with low-density development of new homes and much of firefighting costs are estimated to be attributable to the defense of private property. Ravalli County Commissioner Jeff Burrows said the Bitterroot Valley’s geography has meant lots of development in the wildland-urban interface, a term for where human development meets fire prone areas. “In Ravalli County, we’re 73 percent national forest and public land,” he said. “Basically anywhere you build is in the wildland-urban interface. There’s not a lot of area to build. And a lot of the lower areas of the valley, by the time you take out private property and floodplain areas . between the bottom and where you get to the National Forest boundary there’s not a lot of property left in between there. In 2008, Ravalli County voters repealed the county’s growth policy by a vote of 9,674 to 8,367. State law requires counties to have a growth policy before they can adopt zoning rules to dictate residential and commercial construction areas, stream-side setbacks and other land-use regulations. The county does have several dozen citizen-initiated zoning districts that give local landowners a say in guiding future development. The county also has subdivision regulations that give the Planning Department staff the authority to determine whether to apply certain design standards to subdivisions in high fire hazard areas. Applicants for subdivisions in these areas also must provide a high fire hazard area management plan completed by a professional forester or someone with accredited knowledge in fire suppression for all lots and roadways within the subdivision, including any open space or fuel breaks. Burrows noted the county encourages citizens to take advantage of the Montana Department of Natural Resources and Conservation’s fuels mitigation program, which provides a 50/50 cost-sharing split for landowners to reduce hazardous fuels on their property. Wildfire suppression costs are handled mainly by the state and federal governments, but having lots of residential development in high wildfire hazard areas indirectly affects local budgets, Burrows said. In Ravalli County in the summer of 2017, more than 200 homes built near forested areas had to be evacuated due to the Lolo Peak fire. In the summer of 2016, the Roaring Lion fire near Hamilton burned 16 homes and claimed one life, eventually costing $11 million to fight. Jim Knapp, the chief of the Corvallis Rural Fire District, said the summers of 2016 and 2017 were stressful and expensive for fire personnel in the valley, who all help each other out in times of need. “Since 2000, it seems like every year all the valley fire departments just wonder where the fire’s gonna hit this year,” he said. “I think it’s inevitable that growth will occur in the wildland-urban interface, but I also feel that counties around the state are starting to address some of the concerns. Knapp believes all the fires in the last two decades have taught governments and fire personnel a lot about residential development’s risks. “I think we’re going to continue to see a little bit more responsible growth in the wildland-urban interface,” he said. Montana’s 2017 wildfire season was the state’s worst on record, with more than a million acres going up in smoke. Places like Missoula and Seeley Lake saw long periods of unhealthy air and a drop in tourism revenue. That summer’s firefighting came at a total cost of $400 million, with a record $74 million of that falling on state taxpayers. From 1990 to 2016, Missoula County’s population grew 47 percent while Montana’s overall population grew by 30 percent. The county accounted for 10 percent of all homes built in Montana in that time period, 11,678. Strohmaier remembers two subdivisions that were recently approved in the county, one in a thick pine forest and one on an irrigated pasture, that were both rated as having a moderate fire risk by the county’s metrics. Finlay said his department responds to fire calls year-round. Finlay said he wouldn’t call development in the interface a burden, but acknowledged that houses in these areas present a special challenge. American Resilient Fire Defensive Products and Application Have Arrived in the US Building Industry we are now better at defending homes from fire than ever before.